Well guys, it's almost Halloween! That means overflowing amounts of sugar and candy everywhere we look! If your house is anything like our house, you will be throwing Halloween candy away when you are filling up Christmas stockings... it just never ends! Well now, thanks to Welch's, you can feel just a tiny bit better about Halloween treats! These limited edition Halloween Welch's Fruit Snacks come in special Halloween packaging, and the fruit snacks are in creepy shapes such as a pumpkin, bat, witch and haunted castle! 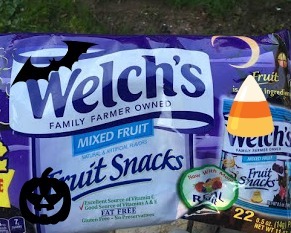 We all know how much all kids LOVE fruit snacks, so give these Halloween fruit snacks from Welch's a chance when you are passing out treats for trick or treaters this year, or when you are picking up a snack for the class Halloween party! (Bonus: you won't be up all night baking cupcakes!) Our kids love these things, and I feel a little bit better giving them these than continuing to help them shove candy in their faces! Make sure to join Welch's on Facebook, Twitter, Pinterest Instagram and youtube to stay up to date with all of their great promotions and new products!